At first, the General Inspector of primary schools in Xieng Khouang Province was Mr. Vanheuang Vongsavanthong and his assistant was Chao Say. The next General Inspector was Thao Tou Bounmasanoun, and his assistant, Mr. Mua Lia. Starting in 1967, Mua Lia was the General Inspector and his assistant was Mr. Bouthalangsy Douangsavanh, until May 14, 1975. Following the changes in the political scene in 1961, the US started providing assistance in education and made it possible for the Hmong and the Lao in MR-II to receive a modest level of education. Pha Khao SD: Bouthalangsy Douangsavanh (now lives in Texas), followed by Chantho Pakdy Monivong. Samthong SD: Ly Lo. After it was attacked in 1968, the school moved to Phak Khe. Long Cheng SD: Yang Ying, followed by Xiong Kao (when Yang Ying was reassigned to Bouam Long SD). School Principal Yang Ying was later moved successively to Long Cheng South, Long Cheng Middle, Phou Sanh, and back to Long Cheng until the day he left Laos for the USA. He died in July 2007 in Minnesota. Bouam Long SD: Xiong Kao. He later moved to Long Cheng SD, and then to Phou Vieng SD. He resettled in Iowa, USA. Ban Na SD: Lo Toua and his deputy, Chanh Phasaiyasith. Lo Toua now resides in Morganton, North Carolina, raising chicken. After Ban Na was attacked, Lo Toua moved to Nam Yone SD to replace Chanh Phasaiyasith, who was reassigned to Nam Pounh Desa SD at Muang Desa. Phou Soh, Phou Sanh Nhai (Song Lai) SD: Yang Yi. He later moved to Pak Meuy SD. Thong Mieng SD: Toumoua Lee. (Resettled in the USA where he died not long after arrival). Muang Soui SD: Khamkone Douangsadeth. He later moved to Phak Kherr/Phou Tao SD. In 1972 there were over 400 primary schools, 161 male teachers, 4 female teachers, 4,788 male students, and 1,054 female students. Based on those numbers, one could notice there was a severe shortage of teachers in Xieng Khouang Province. There were clearly not enough educated teachers with formal degrees from teacher training colleges. The war that erupted in every corner caused risky conditions and discouraged teachers from teaching in MR-II schools. The first principal was Prof. Khamleck, followed by Prof. Toufue. In 1969, Samthong was attacked by the enemy, forcing the Samthong College to reopen in Vientiane, next to the Fa-Ngum College. When Toufue enrolled in the Army, Lechard Daniel, a French native, replaced him as principal. In 1973, Samthong College reopened at Muang Cha (Muang Desa) where Prof. Lychao served as principal until his move to the USA in 1975. Lychao died on October 3, 2009 in Soouth-Carolina. After the battle of Dien-Bien-Phu, the situation in Laos changed drastically with Houaphan and Phongsaly Provinces falling entirely under the control of the Lao Communists. Most of the population who disliked the communist regime had to move into the jungle to fight the enemy or resettled as refugees in other provinces, especially in cities for security reasons. This created a lot of problems for administrative and educative programs. People faced a lack of leadership and many other complicating security issues, as a result of the many facets of communist interferences that had never been experienced before. After the French left Indochina, many hundreds of thousands of refugees from North-Vietnam resettled in several provinces of Laos, such as Xieng Khouang, Vientiane, Savannakhet and Sayabouri. After Kong Le staged his coup d’état, people across the country rushed to the urban centers to flee the fighting that took place in rural areas in provinces like Houaphan, Phongsaly and several other southern provinces. This created administrative confusions and disruptions, and made it difficult for people to communicate and to regroup, except possibly under very rare circumstances. A good example related to the Houaphan part of MR-II where Sim Vichitvongsa served as school principal, followed by Mountri Sophabmixay. Before the French administration, Laos did not have public schools and government-paid teachers. The Lao people then relied on the temples as a place to learn. At that time, over 90 percent of the population did not know how to write Lao; only those who had been in monkhood knew how to read and write Lao. Furthermore, there was a total lack of teaching equipment –only charcoal and paint were used to write on palm leaves. Those who were able to get an education were the ones rich enough to pay for tutors. The lack of education was a definite reason why earlier social development in Laos had been very slow, and why the country did not have too many professional experts. Under the French administration, some progress was achieved in the field of public education because the French created many public schools in the urban areas (and none in the rural areas). In most cases, the French brought in Vietnamese teachers to do the teaching as there were a lot more Vietnamese students than Lao students. Schools in Laos were limited to primary schools –no high school yet. Only kids from wealthy families or civil servants working for the French had access to school. In the rural area, there was no way to go to school at all. Even if you could start primary school, once you graduated, you would still have to have a lot of money to be able to attend high school in Hanoi, North-Vietnam. From the start of the French administration until 1954, only about 30 percent of the Lao population got any form of education. In most cases, only schools from grade 1 to 3 were available in Lao. In higher grade classes, all the lessons were given in French. After 1956, the Lao government started getting some financial assistance from the US and began to build more schools in urban centers and several rural locations, thus allowing more Lao children to go to school. At that point, the percentage of people with reading proficiency rose to 70 percent. We then started seeing professional specialists in education, medical services, agriculture, veterinary, construction, finances and economics, business, administration, etc. In 1973, at the signing of the “Lao Huam Lao” (Lao Coalition) agreement, the whole country was hoping to see an end to the long internal fighting and the various political parties joining hands, becoming united, co-existing peacefully, building and developing the country to be on a par with other countries. Unfortunately, good luck was still not at hand. What we saw was instead another disturbed and widely split country in an even worse condition than what we used to see before in our history. This was the product of the misleading political tactics used by the Lao communists, the followers of the Indochina Communist Party, who violated the agreement and brought in the new communist regime ruled by a single party, creating big turmoil and leading to the arrest of all the rightist leaders, educated people, civil servants, and military and police officers. Some of those who understood the situation chose to flee to foreign countries, based on their previous bad experiences or just to avoid being falsely accused of wrongdoing by the communists. Those who stayed behind were mostly those who did not know where to go. They ended up losing all their rights to freedom under the regime of the Lao communists, who did not have any religion, ignored karma, and blindly practiced dictatorship. The Indochina Communist Party had a plan to indirectly swallow Laos based on the irresponsibility of the red Lao who joined the rank of the communist Vietnamese and asked for their support so they could become leaders in their own country. But, as it turned out, those red Lao ended up being the puppets that killed the Lao people in a most painful way. In 2005, the communist Vietnamese expanded the teaching of the Vietnamese language to Laos and had almost every Lao family fly the Lao red flag and the communist flag (red background flag with hammer and sickle). Pretty soon, those who do not speak Vietnamese may not have a job to do, and Laos might become one of the Vietnam’s provinces under the sole control of the Indochina Communist Party. Laos would then be a neo-colony of communist North-Vietnam, a member of Indochina People’s Federation. 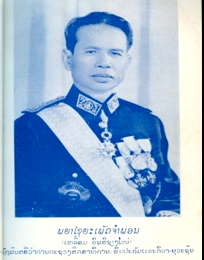 During 1973 – 1975, the Ministry of Education was headed by Phagna Sayaphet Champhone Leuam Insisiengmay, and the Director General of Education was Mr. Khamkhing Souvanlasy. In the past, Lao medical practioners relied on traditional, root-based medicine to treat sick people. Those medicinal roots were dug from plants grown in the forest or from house-grown plants. In some areas, shamans and spiritual healers, who could recite magic formulae to cure patients and get rid of evil spirits, were fairly popular. In neighborhoods that observed Buddhism, monks would normally spray holy water to beef up patients’ morale. Traditional Lao people did not know how to practice hygiene and usually were not very healthy, and were physically weak. One of the most common diseases was malaria, a fever caused by mosquito and other insect bites, bad drinking water and unhealthy environment. Typically, a Lao native would be prone to all kinds of sicknesses that prevented full body development, normal weight, decent height, and competitive sportmanship. The Lao men would get married at an early age and would generally not care too well for their wives. Kids usually grew up unattended, mentally and physically unchallenged, and ended up being unhealthy and not very smart. Life expectancy was relatively short. Some improvements took place under the French administration, especially in the fields of education and public health, with enough medicines, physicians, nurses, surgeons, hospitals, and modern facilities to treat patients. In 1920, hospital facilities were only available in large cities like Vientiane (Mahosot Hospital), Savannakhet, Louang Prabang, and Xieng Khouang. But there was only one hospital in each of those cities, with limited medical supplies, surgical equipment, and medical specialists. There were only a handful of pharmacies around, and most of them had very little medicine to offer. In 1954, medical care improved somewhat, thanks to the medical graduates from other countries who came back to practice medicine in their native country. In 1955, the French and US governments provided modern medical equipment to support their troops fighting the Indochina war, making it also easier to treat local patients. In 1960, the French and the US opened medical training programs for nurses and physicians, and started building hospitals and medical schools at several locations in Laos. Unfortunately, many of those facilities were destroyed during the internal war. The Sene-Souk (Happiness) Hospital in Samthong, Xieng Khouang Province was a good example of a multi-million dollar, fully-equipped hospital built by the US. This hospital was capable of treating no less than one hundred patients per day. When Sam Thong was captured by the enemy in 1969, the whole hospital was left behind and eventually was fully demolished.